This has been a week filled with headlines. We have posted all the stories and videos for your review on line. We have launched a couple of new features. As you may know already. to be released in October can be pre-ordered in three different sets. We also have searched for some pretty rare items. New to U2 ? Well it could be possible.The discography of the Irish rock band U2 consists of twelve studio albums, seven live albums, five compilation albums, fifty-eight singles, and seven extended plays (EPs). 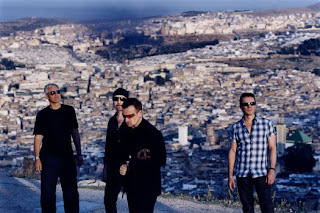 The band consists of Bono (vocals and guitar), The Edge (guitar, keyboards and vocals), Adam Clayton (bass guitar) and Larry Mullen, Jr. (drums and percussion). They formed in 1976 when the members were teenagers with limited musical proficiency. 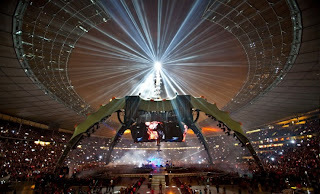 U2's success as a live act was greater than its success at selling records until The Joshua Tree was released in 1987, which helped to increase the band members' stature "from heroes to superstars". U2 responded to the dance and alternative rock revolutions, and its own sense of musical stagnation by reinventing themselves with the 1991 album Achtung Baby and the accompanying Zoo TV Tour. Similar experimentation continued for the rest of the 1990s. Since 2000, U2 has pursued a more traditional sound that retains the influence of their musical explorations. U2 first received Grammy Awards for The Joshua Tree in 1988, and have won 22 in total since, tying U2 with Stevie Wonder as contemporary artists with the most Grammies.